Shifters are unknown to the human world, with the exception of a secret organization—the EOS, referred to as “hunters.” Hunters capture and kill. Some shifters are taken to labs for testing—a place they will never leave—others are deemed useless, a danger to society, and are killed. Shifters travel in packs, constantly moving, and keep themselves hidden to avoid discovery. Horse shifter Flo now travels in a wild pack with what remains of the shape-shifter circus she once performed in. She, bear shifter Jett, and the others seek a new home—somewhere they can feel safe and protected—and a fresh start. As they grow closer to this goal, someone who betrayed them in the past returns to ruin their best hope of finding a secure future. With no memory of life before the circus, Flo, an orphan like the others, is unsure how to live in this new world. But then she’s presented with news: one of her relatives is alive. The discovery comes at a cost, but Flo and her friends will do anything to rescue family, even if it means facing the hunters again. 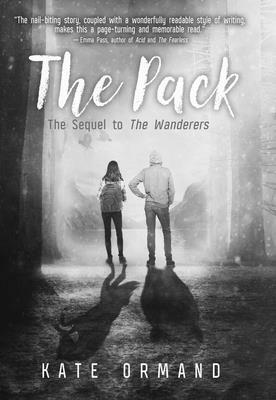 Kate Ormand is the author of Dark Days and shape-shifter circus books, The Wanderers and The Pack. The Wanderers was honored as winner in the young adult fiction category of the 2015 USA Best Book Awards. Kate graduated from university with a first class degree in fine art painting. During this course, Kate discovered her love of reading young adult books, prompting her to try a new creative angle and experiment with writing. She also writes children’s picture books under the name Kate Louise. She lives in Chesire in the United Kingdom.